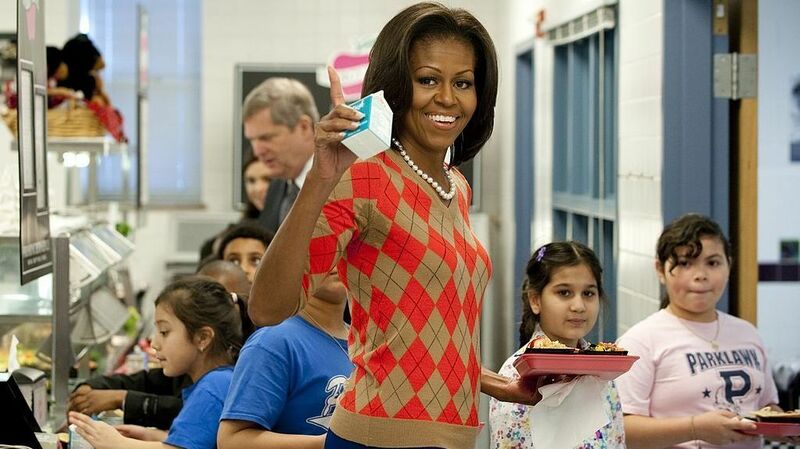 Michelle Obama's School Lunch Rules Rolled Back By White House The Department of Agriculture is curbing some school lunch standards championed by the former first lady, including stricter requirements on whole grains and sodium content. Former first lady Michelle Obama waves alongside school children while walking down the school lunchline after getting turkey tacos at Parklawn Elementary School in Alexandria, Va., in January 2012 to promote new nutritional guidelines for school lunches. Former first lady Michelle Obama might find some of the latest actions by the Trump administration pretty difficult to stomach. On Monday newly minted Agriculture Secretary Sonny Perdue announced a rollback of school lunch standards championed by the former first lady, declaring at a Virginia school that the administration would "Make School Meals Great Again." The school nutrition standards have long been a source of controversy, making them a more likely target of the current administration. Earlier Monday, CNN initially reported a more surprising cut — that the Trump White House would not continue the Let Girls Learn program in its current form. The initiative aims to provide educational opportunities for young women in developing countries. However, administration officials later clarified that the program was not being axed. "There have been no changes to the Let Girls Learn program. The Administration supports policies and programs to empower adolescent girls, including efforts to educate them through the completion of secondary school," a State Department official told NPR. "We are committed to empowering women and girls around the world and are continuing to examine the best ways to do so." The former first lady launched the Let Girls Learn initiative in 2015, saying that it would tailor an approach to the problem girls face in many developing countries, including being forced into child marriages and not having appropriate bathrooms for girls who may seek to attend schools. "You have told me that whatever obstacles these girls face — whether it's school fees, or violence or cultural beliefs that girls simply aren't worthy of an education — you've said that these problems will not be fixed from on high," Obama told activists who pushed for the approach. "That these are community challenges that call for community solutions." The first lady made the initiative a priority of her husband's final years in office, traveling in 2016 to Liberia and Morocco with her daughters, Malia and Sasha, and actresses Meryl Streep and Freida Pinto. Promoting healthy eating and combating childhood obesity were also top priorities for Michelle Obama. Curbing the requirements that Obama pushed for, Agriculture Secretary Perdue argued on Monday that the standards led to children simply not eating the lunches. "This announcement is the result of years of feedback from students, schools, and food service experts about the challenges they are facing in meeting the final regulations for school meals," Perdue said in a statement. "If kids aren't eating the food, and it's ending up in the trash, they aren't getting any nutrition — thus undermining the intent of the program." NPR's Allison Aubrey reports that the School Nutrition Association, which represents school food administrators, has been pushing for the changes. The affected standards involve whole grain requirements, sodium content and milk options. The USDA will now let states grant exemptions regarding whole grain standards for the 2017-2018 school year if they're having trouble meeting the requirements, and the agency said it will "take all necessary regulatory actions to implement a long-term solution." Sodium reductions set in place by the Obama administration will be postponed for at least three years to "provide schools and the school nutrition industry with the certainty and predictability they need to make appropriate plans for creating foods with the appropriate amount of sodium." Milk requirements would also loosen, allowing schools to serve 1 percent flavored milk. The fight over school lunches has lasted years. Even after the Healthy, Hunger-Free Kids Act of 2010 took effect, Michelle Obama continued to have to defend its importance, as NPR's Tamara Keith reported in 2014. In 2016 the Senate settled on a compromise that would keep most of the new standards in place, including requiring to schools to serve more fruits and vegetables along with the planned reductions in sodium and increase in whole grains. A spokeswoman for first lady Melania Trump confirmed that Mrs. Trump does plan to keep up the vegetable garden that Michelle Obama planted at the White House.